You take your seat inside the small booth, sliding behind the table. Your Contractor slides into a matching seat across from you. The circular room houses another seven near-identical booths, and you watch them fill up over the next few minutes - Pairings of Contractors and Data Jockeys in each booth, glancing around at the others and tapping at menu screens the same way you do. Five minutes go by while you're forced to listen to a pop song from five years ago remixed to a digital beat that could possibly have been sourced from the latest stock market feed. That's been the rage lately. Apologies for the lack of updates lately. After prepping for PAX Aus, attending, travelling back, then getting back to getting my life in order, back to work, and being knocked around with hayfever, I've had very few chances to blog. 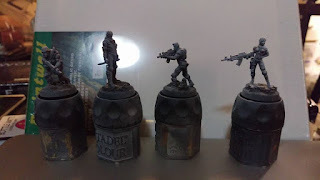 Anyway, this is a quick shot of my next project - some Haqqislam models from Infinity by Corvus Belli. I'm planning on trying out the Sketch Style of underpainting (See Contrast Minis for a better description than I am able to give) to see how quickly I can get them done. These have been sitting on my desk for a while, and even if they are quick models to test out a style on, it will by fun to at least get some more progress on them, as well as try out a new technique to see if it is something I want to try using more in the future.